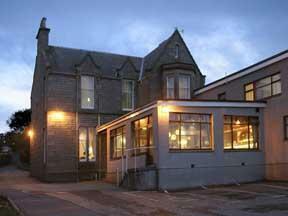 Choose from 5 hotels and guest houses in Shetland-Islands. Shown below a just a selection of the hotels available. To search within an area please use the menu on the right. The Lerwick Hotel - Modern & well equipped hotel 10 minutes walk from the town centre, nestling on the shore of Breiwick Bay Ideal base for both the holiday or business traveller. 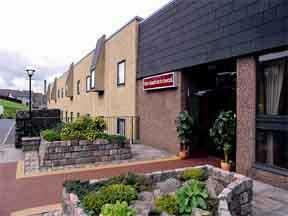 This attractive hotel is well equipped for the modern traveller and close to local amenities. Situated on the edge of the sea with unrestricted views over Breiwick Bay and the island of Bressay. Fine cuisine is offered in either our special Seafood Restaurant or Brasserie Restaurant, where local produce is uniquely prepared and served. Ideal location for private functions & business meetings. Welcoming and helpful staff will help to make your stay an enjoyable one. 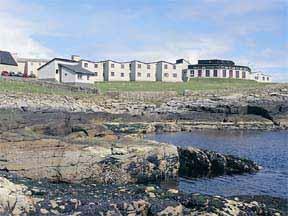 Busta House Hotel - Overlooking the shore of Busta Voe, on mainland Shetland, Busta House is a lovely old building with en suite bedrooms, large garden and superb local food. Between the village of Brae and the island of Muckle Roe, Busta House is close to the geographical centre of Shetland - a good base for exploring the islands. Try the fresh local food on offer. There is a choice of wine and some 160 malt whiskies. Enjoy free Wi-Fi in all public areas and a few of the bedrooms. All other bedrooms have modem connections and there is a computer at reception for you to use if you need. Built in the 16th, 17th and 18th centuries, there is no lift at Busta House, so expect steps! The Shetland Hotel - Situated in Lerwick, Shetland's main town, the Shetland Hotel provides an ideal base for all your requirements. Lerwick is Shetland's capital, and is itself a busy cosmopolitan and charismatic harbour town full of history. Ideal for the business guest who can take advantage of our central location and well equipped conference, meeting rooms, and office suite - or for the leisure traveller, very convenient for the Holmsgarth Ferry Terminal, spacious modern bedrooms, and the Oasis Bistro offering local and international cuisine. Herrislea House Hotel - We will warmly welcome you at our country location, 7 miles from Lerwick, where you will be at the centre of Shetland, and the centre of our attention. Our well-maintained hotel has an impressive mix of furnishings, creating a unique style in the public areas. We have 13 well-appointed, individually decorated, en suite bedrooms. You can dine in our Phoenix Restaurant where we use and promote the finest of local produce. The Kveldsro House Hotel - The Kveldsro House Hotel - The country home hotel in town. Perfect for the discerning business executive or the individual traveller on a short or long break Located in the centre of town in discreet surroundings, but within easy walking distance of the old harbour and main shopping street and with ample private parking.